The lasagna was excellent and a nice starter when split in half. It’s a hearty way to start lunch on a cool day. Again, the ingredients were flavorful and the sauce was very good. The sauce is the key to any pasta or pizza. I’m looking forward to trying a pasta dish with fewer ingredients so I can see how the sauce it without the cheeses and meats. Even though I’m only about 15 minutes away, Plantone’s isn’t in a part of Las Vegas that I visit very often. I probably wouldn’t have visited without the invite. I’m glad that I was given the heads up on this deli/restaurant and will happily return when someone is looking for a place to grab a quick bite in that area. Visit Plantone’s Italian Market for a menu and more information. For the past year, I’ve generally written for other people and websites. You see those links posted here when I see the articles are live. That’s taken me away from this blog and the VegasPhotoBlog. I usually visit bars, restaurants, and casinos in the touristy areas. The majority of my opinions are shared elsewhere. As you’ve seen I share those articles with other websites. However, I’ve been visiting more local bars and restaurants than ever before. I rarely write about my local experiences because the traffic gods say that most of you want to read about the cool new spot on the Vegas Strip. I understand that because I used to be the same way. I generally share my thoughts on local bars and restaurants directly with those who are specifically looking for something away from the action. I’ll be sharing more about those local joints for those people on this blog. I won’t waste time with places I don’t like unless I have a really awful experience. I have a few bars and restaurants saved to share and a few more that I know I’ll be visiting soon. I’ll probably end up using a lot of this elsewhere when I compile a significant number of recommendations. The reviews I write will be short and sweet like when I visited Therapy in downtown Las Vegas. The photo above is from Evel Pizza which will be one of my first new recommendations. I finally made it to Yardbird at The Venetian last night! This has been on top of my to-do list for a while. The restaurant has been receiving rave reviews from people who I trust since it first opened. I just haven’t been to The Venetian much this year. I used to visit The Venetian a couple times a week when I first moved to Las Vegas but not so much in the past year. It used to be home to fast free wifi on the Vegas Strip but now just about every casino has wifi so there isn’t a need to visit as often. Bacon Bourbon – Wild Turkey 81 – Bacon booze (wine, whiskey, bourbon) doesn’t actually taste like bacon. There’s usually a smokiness to the booze. The bourbon is light and not overpowered by any flavor. This was very easy to drink. It was a good way to ease into the more flavorful bourbons. Honey orange – Woodford Reserve – This was aromatically insane. There is a heavy orange scent to this bourbon. Once I moved past the aroma, this was my favorite of the batch. This is easy to drink and it felt and tasted like bourbon with more than a hint of orange. Apple Spice – Knob Creek Small Batch – My thoughts going in were that this sounds like something for sick people. This was my least favorite because I don’t really like apple spice. However, my opinion changed when I added the shot to the leftover ice from my Old Fashioned. The ice lessened the apple spice attack and it was nice. Salted Maple – Maker’s Mark – This was so damn sweet that I didn’t know what to make of it at first. However, the maple was interesting and I came around to enjoy it later in the evening. It took a while before realizing that my mouth needed to drink this without apple, orange or any other flavor to appreciate it. Overall, I enjoyed the tasting. The $25 tasting price is in line with the prices you’d expect to pay at The Venetian. 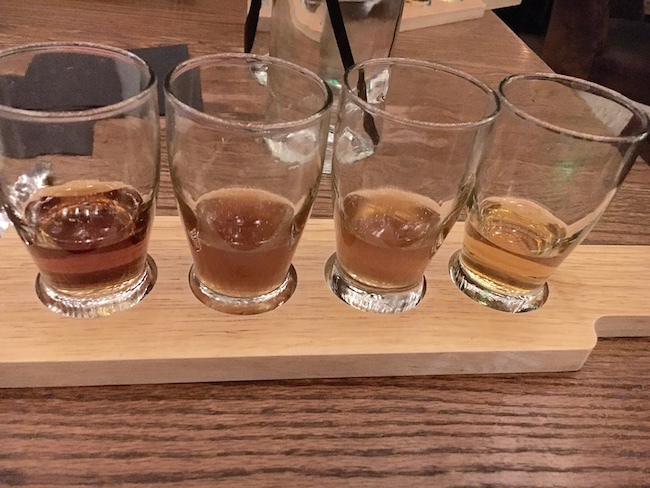 I’ll get into the meal that accompanied the meal later but I want to get my thoughts on the bourbon tasting since it’s only available for the month. Since I was tasting bourbon I wanted to extend that to one of their signature cocktails. Looking at the bar menus I settled on an old reliable. 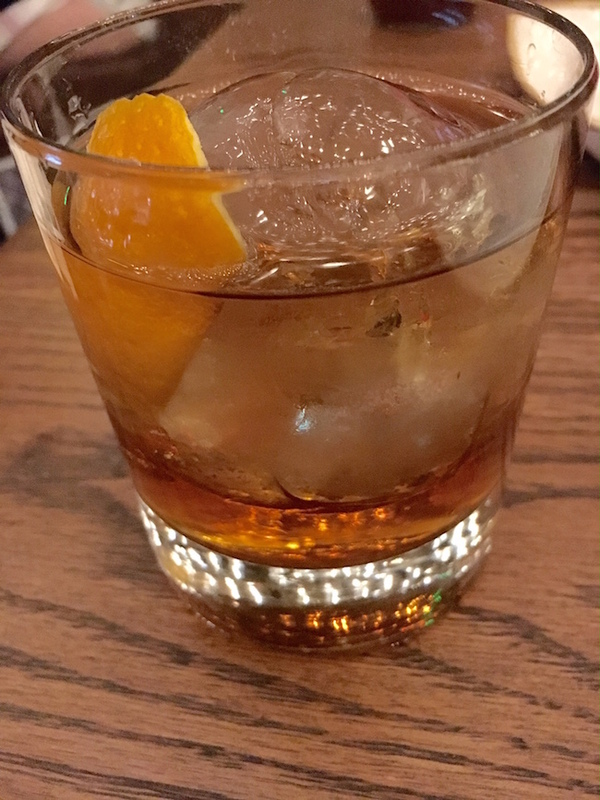 The Old Fashioned is always a safe bet and it was delicious. It was so good that I had one for dessert too. The term handcrafted is thrown around often nowadays but it’s legitimate at Yardbird. They carve the ice at the bar every day. They make many of the ingredients for their drinks fresh at the restaurant. This is what you expect when you’re paying top of the market prices for cocktails. G2E is just a few weeks away and I expect to see another visit or two in my future. The booze at Yardbird was good, but the food was great. Stay tuned. I was skeptical about returning to Tilted Kilt at The Linq. However, the Sam Adams menu gave reason to visit again. First, let me give a little back story on my experience with Tilted Kilt. This will help you understand why I questioned ever returning. I went to the media preview shortly after Tilted Kilt first opened at The Linq. My expectations for chain restaurants are rarely high. 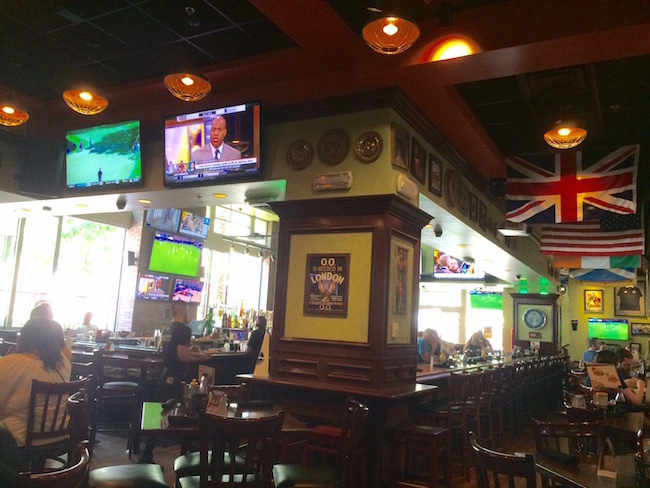 However, on that first visit to Tilted Kilt the food, drink and service were worse than the mediocre expectations. I decided not to review the experience since it was only a media preview. Full service might be better but I wasn’t willing to find out. …Besides, I was staying at The Linq hotel (see review and pics at Top 10 Vegas) so it was convenient to give Tilted Kilt another chance. The service on this visit to Tilted Kilt was much better than the first visit. The service and staff were what you would normally expect at a bar/restaurant/breastaurant. We talked to a few different people working during the visit and everyone was nicer and seemed more experienced than the first visit. 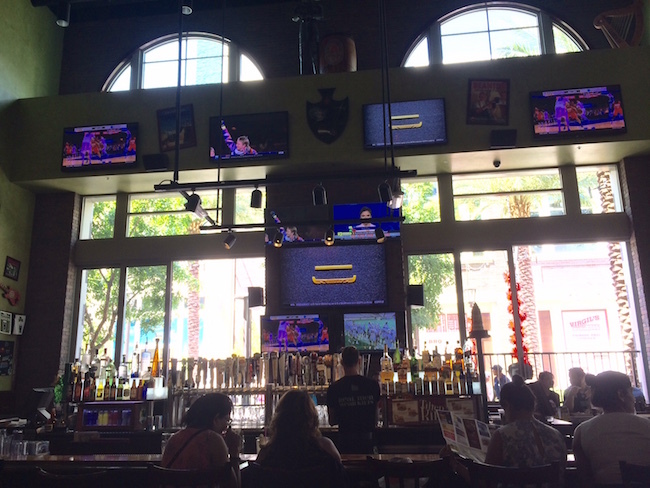 The setup at Tilted Kilt makes it a good option for watching football on the Vegas Strip. There are plenty of seats and TV’s to watch the action. I only snapped pictures of two viewing areas. There’s also a pull-down screen for a feature game that was behind the table where we ate. The Linq has a lot of foot traffic but many of those people are just walking around The Linq and not actually going into bars, restaurants and stores. That could make finding seats to eat and drink on football weekend somewhat easy to come by. 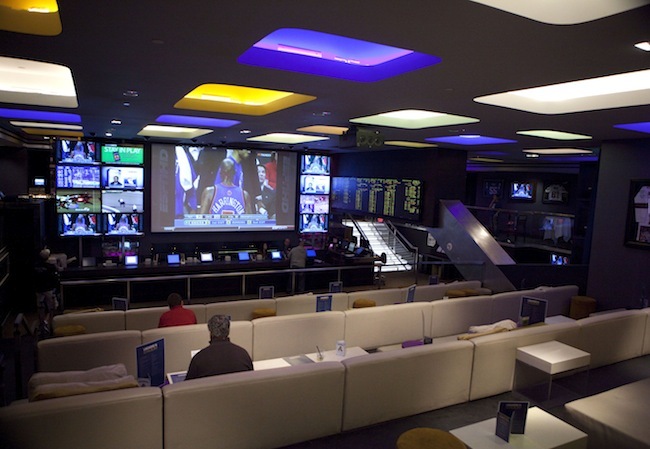 It’s located next to The Linq sports book (photo on Vegas Photo Blog) in case you need to wager on some games. 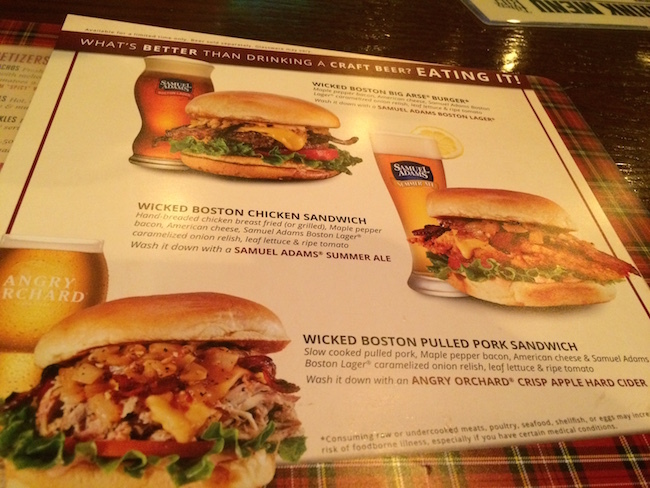 The Sam Adams menu offered a few different beer and sandwich pairing options to choose from. I planned on getting the Big Arse Burger but chose the massive chicken sandwich at the recommendation of the waitress. The Wicked Boston Chicken Sandwich has a massive fried (or grilled) chicken breast, maple pepper bacon, cheese and Sam Adams Lager caramelized onions, which I got on the side to taste separate. I may have chosen the chicken sandwich because Sam Adams Summer Ale was the recommended pairing. I love summer brews. 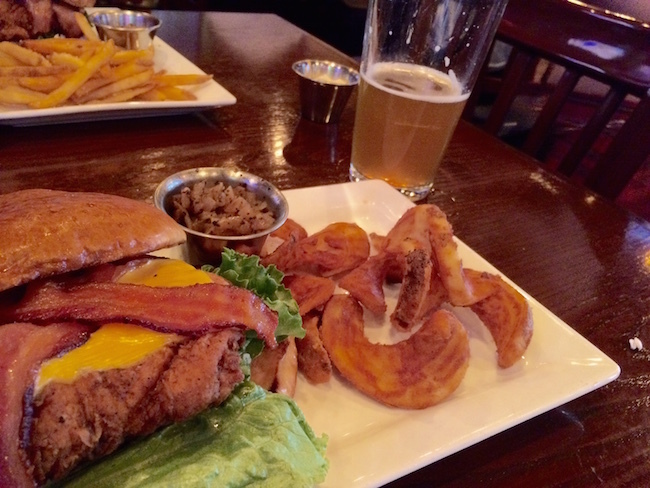 The beer was a perfect complement to the chicken sandwich on a hot summer day in Vegas. I think my friend and I only made it through about 3/4 of the sandwich before tapping out. Lunch was very good, but we had a full day of Vegas ahead and didn’t want to be sluggish from eating too much. Las Vegas is best in the summer when you don’t eat too much. Lunch on the Vegas Strip will often run about $20 for food and a beer. The Sam Adams sandwiches and beer pairing is no different. I really enjoyed the chicken sandwich and thought that the price was right. This kind of meal is a great way to start the day. Looking back, I’m glad that I returned to Tilted Kilt. 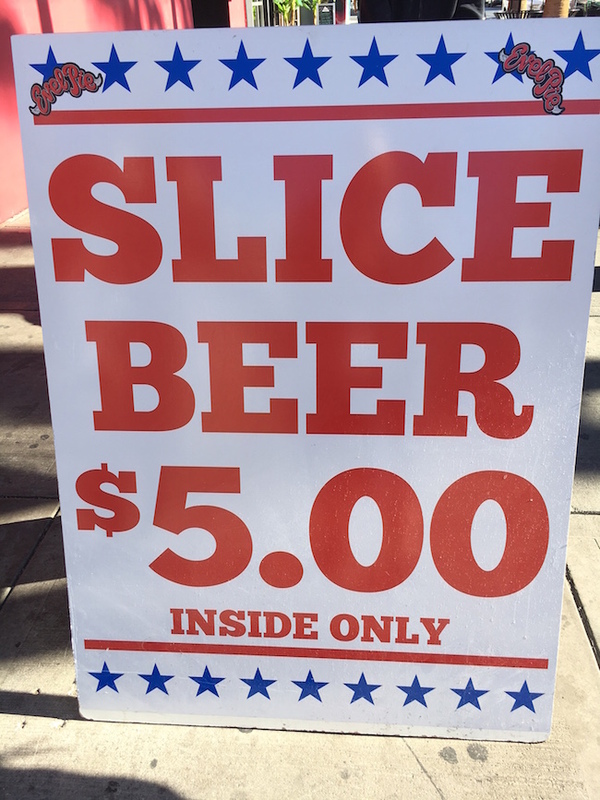 I’m always looking for a new place to grab a casual bite on the Vegas Strip. It’s even better when that lunch spot has TV’s where I can watch the games. I’ll keep Tilted Kilt on my mind the next time (because there’s always a next time) I’m in the middle of the Vegas Strip on a Sunday looking for a place to watch football. I’m 90% sure I’ll be ordering the exact same meal from the Sam Adams menu. I’m just back from Lunch at Therapy on Fremont East and feel the need to share how good it was. This is one of the best lunches I’ve had in a while. This isn’t an in-depth review, rather just how the food hit me as I as eating it. 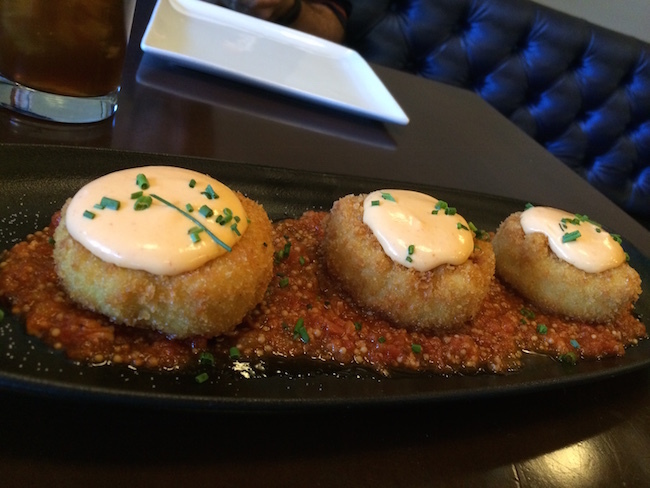 Mac & Cheese Croquettes will make you forget it’s 108 in the share. Thought 1 yesterday – I need this and I need this now. Thought 1 today – I’ll share this if you want but I’ll eat the whole order myself. You’ll share? Great. I can try more food. Thought 2 today – After food arrives, these look pretty. YO! 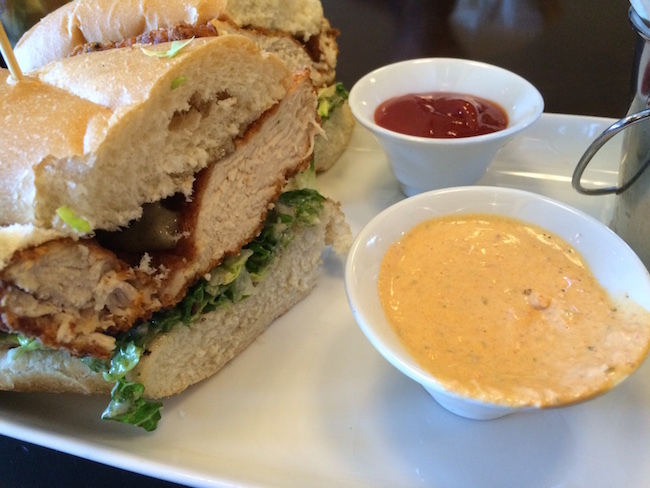 That red pepper aioli is what’s up! Thought 3 today – I can eat a hundred more of these or I can eat no more because they were so good. In conclusion, the Fried Mac & Cheese Croquettes were everything I imagined and more. DELICIOUS! Thought 1 today – Waitress said it’s her favorite item on the menu. I was stoked. Thought 2 today – First taste was okay. Not overwhelming, not underwhelming, just fine. Final thought – Every bite tasted better than the bite before. In conclusion, this was a legit fried chicken sandwich. The chicken breast was big yet juicy, crispy and delicious. I can’t wait to finish it for dinner. The service at Therapy was very good, the food was excellent (friend said the burger was very good) and the prices were reasonable. Therapy will become one of my regular places to get lunch when I’m in downtown Vegas. Visit therapylv.com for menus, hours and more information. Since choosing this place for lunch, I can’t get this old Therapy? song out of my head. You’ve probably never heard it before. Enjoy. You can now use your comp dollars from The D at Le Thai and Bocho (a restaurant I’ve never heard of until now). Le Thai is a favorite of just about everyone who’s open to experiencing Thai food. Great prices help those who might not normally be willing to experiment with this kind of cuisine. There aren’t many dining options at the casino and that makes this is a nice perk from the Club D players club at The D. Little things like this go a long way to making The D one of the best casino experiences in Downtown Vegas. The D Las Vegas, home to award-winning restaurants including Joe Vicari’s Andiamo Italian Steakhouse and American Coney Island, is expanding its guests’ dining experiences through an innovative business partnership with the Downtown Project and Fremont East restaurants Le Thai and Bocho. Effective immediately, members of Club D, the property’s players club, can use their comp dollars toward meals at both of Chef Dan Coughlin’s highly acclaimed Asian eateries. This collaboration marks the first relationship that connects a downtown casino with the Fremont East restaurants. Founded by Chef Coughlin, Le Thai (523 Fremont St) and Bocho (124 S 6th St.) both have made their mark as Las Vegas dining staples. Le Thai, inspired by Chef Coughlin’s Thailand-born mother, is renowned for its famous three-color curry, homemade Thai noodle soup, short-rib fried rice, signature waterfall sauce and authentic pad thai – an ode to Coughlin’s grandmother. Down the street, sushi lovers can visit Downtown Project’s Bocho, a traditional Japanese restaurant overseen by Chef Joon-Yong Cho featuring a wide range of sushi, sashimi and bento boxes, as well as private dining and karaoke rooms. Chef Cho ups the ante with innovative sushi offerings like amberjack and ocean trout. Registering for Club D is free and available to guests ages 21 and over. Members can earn comp dollars by playing slots, table or video games in the D’s thrilling two-story casino. In turn, these can be exchanged to dine at Le Thai and Bocho at the guest’s leisure. Club D members also can enjoy dining, show and room comps at the D; invitations to exclusive events, parties and tournaments; special room rates and more. For the past couple of NFL seasons Lagasse’s Stadium has done a fun Monday Night Football promotion. They create a special football menu that pays tribute to the team’s playing each week. The prices aren’t discounted but the promotion offers dishes you wouldn’t normally find at Lagasse’s Stadium. Consider this is a fun excuse (like you need one) to head over to one of the best sports books in Vegas.